Is this what the new Godzilla will look like? 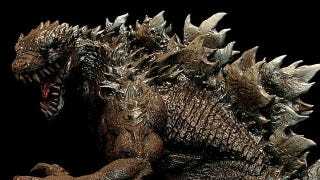 Will Legendary Pictures' new Godzilla be a return to awesomeness for the O.G. kaiju, or another disappointment like the Emmerich fiasco? We saw a smidgen of concept art back at Comic Con 2010, but nothing since then. So the above image is a good sign, we think. It's the work of sculptor Hector A. Arce, and apparently it's a sculpt of Godzilla he did a few years ago. The sculpt impressed Legendary so much, they hired Arce to work on the design team for the movie, and inside sources tell the website Infamous Kidd that the final version of Godzilla in the movie won't be too different from this look. And they report that Godzilla will be more rubber suit, less CG. You can see more of the sculpt at Arce's website.